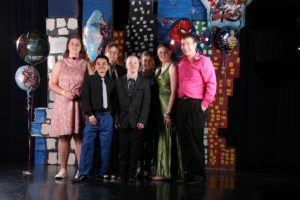 Best Prom Ever is a giant event attended by hundreds of differently abled guests from the ages of 14 to 100. This special event is FREE and includes Dinner, Dancing, Limo rides, Photo booth, Formal pictures, Giftbags, and oodles of FUN! Our volunteers are specially trained to be sensitive to the needs of our guests, but honestly they come to have fun too! We have great security and medical support to ensure that our guests will enjoy themselves safely the entire night. Many many students from schools around Kent County, churches, and sports teams come to wait tables and liven up the dance floor. We also offer free formal dresses in the months prior to our spring event. These dresses are donated and prepared by students and are FREE to anyone.